This survey should be seen in connection with survey 7 about the period of stay. It is a fundamental precondition for the Temporary Admission procedure that the aircraft has a fixed base outside the EU but a frequently asked question subsists: which facts can indicate that the operator/aircraft has become ‘resident/domiciled’ in the EU airport even though an official home base is established outside the EU? We have therefore commissioned another verification survey about this subject. An aircraft is owned by a non-EU SPV and have an US (N) aircraft registration. The UBO (non-EU passport holder) is living locally in the EU member state and have organized a local hangar for an unlimited period. The aircraft has been flying in and out of the EU every month on a regular basis for the last year but does always return locally after each flight. Even though we have earlier ourselves received a statement from HMRC (UK Customs) confirming interpretation of the 6 months period mentioned in survey 7, we do often hear about the 180 days’ rule in the UK which states that an aircraft can at a maximum stay of 180 days within a year. This rule has no foundation in the EU legislation. The 180 days’ rule might be meant to accommodate aircraft which often visits the UK with the Temporary Admission procedure and does not accommodate aircraft with a fixed UK base. We do not have knowledge about the 180 days’ rule in other EU member states but regardless of this everyone should be careful overstaying at the same airport/EU member state. The feedback is unanimous; the mentioned aircraft can no longer stay in the EU member states based on the Temporary Admission procedure. A future stay will require a full importation. Malta seems to have misunderstood the question and for this reason their answer is not listed. The result shows that different facts can indicate that the operator/aircraft has become ´resident/domiciled´. The important question is simply: where does the aircraft ´live´ the majority of time or have a special connection to? The set-up used has established the operator/aircraft as ´locals´ and this can happen even with a stay shorter than 6 months. Each case needs to be looked upon individually. One or more of the above indicators does not necessarily mean that the aircraft is considered to have a fixed EU-base. A lot of the above-mentioned points can easily be eliminated by not having a ´resident/domiciled´ behavior. 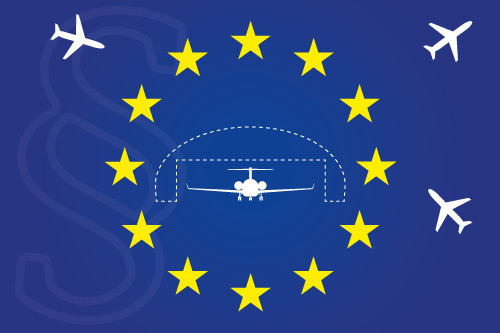 Our opinion is that if the aircraft behaves as ´resident/domiciled´ in the EU it must be fully imported. How will local customs authorities judge the mentioned case? This is a grey zone and it is risky to have a behavior as ‘resident/domiciled‘ with the Temporary Admission procedure without a specific case ruling from the local customs approving of multiple, continuously stays at the same airport/EU member states. A stamp on the ‘Supporting document for an oral customs declaration‘ does not mean that the local customs have accepted a certain behavior. The stamp simply documents the date of entry.